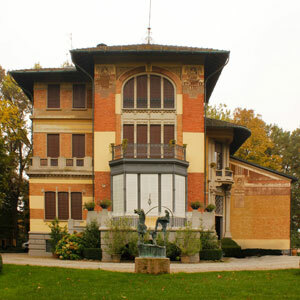 On March 14th 1910 the project of the Villa was submitted on behalf of Lieutenant Claudio San Donnino. It was later to become an exquisite example of Emilia Romagna "liberty". Frescoes and decorations by Aroldo Bonzaghi (1887-1918) with evocative and voluptuous "dannunzian" allegories generate a magical atmosphere. In that extraordinary place, Davide and Cristina invite you to taste special products of Villa San Donnino. It is used as a condiment to give the final touch to a very wide range of dishes, from the most refined and elaborate to the cheapest and simplest. It has been used for centuries in the cuisine of Modena with meats and boiled vegetables, best when still hot, and in all egg recipes. More recently "Tradizionale di Modena" has been used on raw and cooked fish and meat roasts or casseroles. 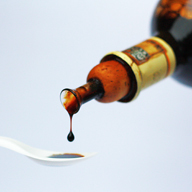 Consortium of Producers Of the Traditional Balsamic Vinegar of Modena, hereafter referred to as ABTM, is one of the oldest and without doubt, the most typical product of the agricultural food industry in the province of Modena. It is not known for sure how it originated and some say it was invented by accident: as Traditional Balsamic Vinegar derives from the natural acetous fermentation, followed by a long ageing period, of boiled grape must, it seems probable that the product developed by chance through the reaction of these microbiological processes in containers of boiled grape must, (called "saba", a traditional ingredient in local cuisine, already used in Roman times as a sweetener with honey), followed by the intervention of Man who set up the production techniques still used today. DOP law relating to the denomination of controlled origin - D.O.C. and the denomination of protected origin - D.O.P. 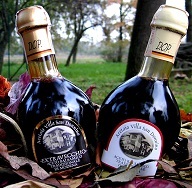 As already said, Traditional Balsamic Vinegar of Modena derives from the fermentation of boiled must by particular families of acetobacter, very often organised in bacterial colonies called "mothers", and of the subsequent slow maturation by enzymes over a long drawn out period, with mainly chemical–physical type transformations. 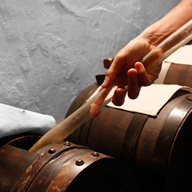 The must used to obtain Traditional Balsamic Vinegar of Modena comes from crushed "Trebbiano" and other traditional grapes of Modena, for example "Lambrusco". The grapes are pressed and the separate uncooked grape juice or "must" is poured into open cooking vats. It is then boiled over an open fire where it is reduced and slowly concentrated. Boiling evaporates a variable quantity of water and devitalises the microbe load present at the start of the must causing it to lose its natural tendency to transform into wine. The cooked must is dark, distinctly tasty and perfumed, with an elevated sugary content. After boiling the must is cooled, decanted and placed in a series of casks of decreasing volume and different wood (oak, chestnut, mulberry, cherry, juniper, etc.) Each series of individual casks is called a "battery", and is left in the lofts of houses where it is subjected to seasonal temperature variations.